Late May 2015: The FBI reportedly begins an informal investigation into Clinton’s emails. Shortly After July 6, 2015: FBI Director Comey wants no special treatment for the Clinton email investigation. At some point in late summer, after two inspectors general sent a “security referral” about Clinton’s emails to the FBI on July 6, 2015, FBI Director James Comey meet with John Giacalone, head of the FBI’s National Security Branch. Giacalone briefs Comey on the referral and says he wants to investigate how classified secrets got in the emails and whether anyone had committed a crime in the process. July 23, 2015: Accounts differ if the FBI has started a criminal investigation into Clinton’s emails. The next day, a Justice Department confirms the report. But later in the day, the Justice Department backs away from its characterization of the referral as “criminal.” (The New York Times, 7/24/2015) (The Washington Post, 7/24/2015) Indeed, such a request was made on July 6, 2015. But technically, the referral is called a “security referral” and not a criminal one. August 2015: A company recommends improving security for Clinton’s server, which is still in use, but the FBI wants no changes. 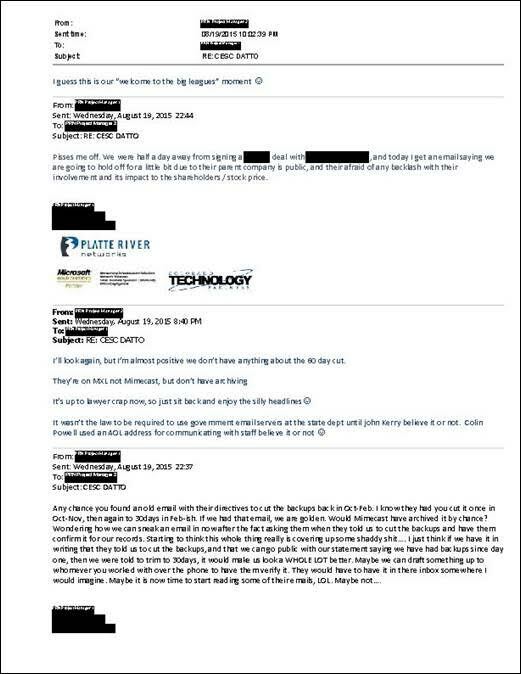 At some point in August 2015, employees at Datto, Inc., a company that specializes in backing up computer data, realize that a private server they have been backing up belongs to Clinton. The server is being managed by Platte River Networks (PRN), and Datto made the connection after media reports revealed PRN’s role. According to an unnamed Datto official, due to worries about the “sensitive high profile nature of the data,” Datto then recommends that PRN should upgrade security by adding sophisticated encryption technology to its backup systems. Boian adds, however, the company did not take Datto’s concerns to the FBI. On August 12, 2015, the FBI takes an older version of the server from PRN’s control. The FBI doesn’t realize Clinton’s emails were moved from the old server to the new one. They eventually will figure this out and take the new server away as well, on October 3, 2015. August 2015—Spring 2016: Justin Cooper is interviewed by the FBI three times. Justin Cooper is a former Bill Clinton aide who helped Bryan Pagliano manage Clinton’s private server while Clinton was secretary of state. Cooper appears to have been the first key play in the Clinton email controversy to have been interviewed by the FBI. August 6, 2015: Clinton’s lawyers give the FBI a thumb drive containing over 30,000 Clinton work-related emails. Williams & Connolly, the law firm of Clinton’s personal lawyer David Kendall, gives the FBI a thumb drive which has a .pst file containing 30,524 emails. On December 5, 2014, Clinton’s lawyers gave the State Department 30,490 emails, sorted to be all of Clinton’s work-related emails. It isn’t clear why there is a 34 email difference. On July 31, 2016, the Justice Department asked Kendall to turn over his thumb drive. August 17, 2015: The company that recently managed Clinton’s private server, says it is “highly likely” that a backup copy of the server was made. That company is Platte River Networks (PRN), which managed her server from mid-2013 until early August 2015. The company is cooperating with the FBI. October 2, 2015: The company that makes a back-up of Clinton’s server data is given permission to share the data with the FBI. Platte River Networks (PRN) has been managing Clinton’s private server since June 2013, and since that time they used the service of another company, Datto, Inc., to make back-ups of the data on the server. As a result, they need PRN’s permission to share data. On this day, David Kendall, Clinton’s personal lawyer, and PRN agree to allow Datto to turn over the data from the backup server to the FBI. This is according to an unname person familiar with Datto’s storage, quoted in McClatchy Newspapers four days later. A Datto back-up device was attached to the server, and the data was backed up to the “cloud” as well. It is unknown if the FBI ever gets useful data from the cloud copy. October 3, 2015: The FBI picks up the most recent Clinton email server, which is still being used by Clinton. Although the mainstream media in 2015 generally mentions only one Clinton email server, there actually are two in existence at this time. Both are located at an Equinix data center in Secaucus, New Jersey, and both are managed by Platte River Networks (PRN). Clinton’s emails and other data had been transferred from the old server (which the FBI will later call the “Pagliano Server”) to the new server (which the FBI will call the “PRN Server”) in late June 2013, leaving the old server mostly empty but still running. On August 12, 2015, the FBI only picked up the old server for analysis. October 16, 2015: A former FBI official claims that many FBI agents are upset about Obama’s comments. October 16, 2015: Clinton’s lawyer gives the FBI two BlackBerrys that prove useless to the FBI’s Clinton investigation. On this day, Williams & Connolly, the law firm of Clinton’s personal lawyer David Kendall, gives two BlackBerrys to the FBI and indicates they might contain or have previously contained emails from Clinton’s tenure as secretary of state. But FBI forensic analysis will find no evidence that either BlackBerry were ever connected to one of Clinton’s personal servers or contained any of her emails. The two BlackBerrys don’t even contain SIM cards or Secure Digital (SD) cards. October 22, 2015: FBI Director James Comey comments about the FBI’s Clinton investigation. Politico reports, “The FBI’s recent moves [regarding Clinton’s private emails] suggest that its inquiry could have evolved from the preliminary fact-finding stage that the agency launches when it receives a credible referral, according to former FBI and Justice Department officials interviewed…” The FBI has been conducting interviews and gathering documents. December 9, 2015: President Obama is not being briefed about the FBI’s Clinton investigation. December 11, 2015: Emails from Clinton’s computer technician are missing. December 22, 2015: Pagliano is secretly interviewed as part of an immunity deal with the FBI’s Clinton investigation. Clinton’s former computer technician Bryan Pagliano makes a “derivative use” immunity deal with the Justice Department by this time, though it’s not clear exactly when this happens. Then he gives testimony to the FBI and the Justice Department as part of the FBI’s Clinton investigation. Apparently he speaks to investigators at least twice, though it is not known when the second interview takes place. “Derivative use” immunity wouldn’t prevent investigators from prosecuting Pagliano, but limits them from using any evidence derived from his testimony against him. December 31, 2015: The State Department hasn’t asked other departments to help find any missing Clinton emails. In September 2015, the Defense Department gave the State Department some emails between Clinton and former Army General David Petraeus that Clinton had previously not turned over. However, in the months since, the State Department does not appear to have reached out to other departments to determine if they also have copies of emails Clinton failed to turn over. McClatchy Newspapers questioned over a dozen other departments. All of them either said they hadn’t been contacted by the State Department about this or failed to give an answer. January 10, 2016 and July 2, 2016: Clinton gives an explanation of her “send nonsecure” email on two occasions. January 29, 2016: FBI agents are saying “something’s happening” with their Clinton investigation.